When Toronto's Rival Boys released a chilly EP earlier this spring you knew that a full length was to follow. Well Animal Instincts has arrived and it's a solid entry from the trio. It's difficult to pigeonhole Rival Boys' music. When the album begins with a blistering live wire guitar charge in "Fortune", it's easy to hang a hard rock label on it. However, once the electric violin of "Young and Old" hits, your left a bit befuddled by it (in a good way). Rival Boys transition from lush to ramshackle while leaning on that aforementioned violin on the closer "I'll Believe In Anything". The back and forth between sister/brother Lee and Graeme Rose on "Construction Work" is charmingly nestled in a roots rock blanket. The band get minimalist on "Valentine Notes", which is in sharp contrast to the cresting violin and guitar of "Cruel Words". Your head will bop slowly and methodically with the mesmerizing rise and fall of "Don't Bloom"'s stout bass line. It's trumped only by the careening rock and shout-it-from-the-rooftops refrain of "Cannon Ball". 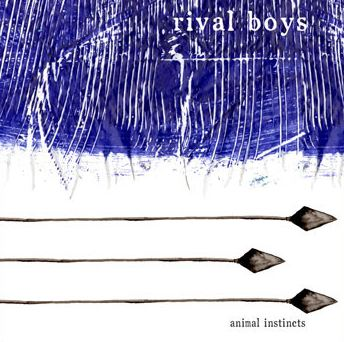 In all Animal Instincts is a strong and diverse record that should have wide appeal for rock and indie music fans. Rival Boys play Taste of Toronto at Fort York on July 27th. Best tracks: "Cannon Ball", "Construction Work"